Imaging in all three spatial dimensions is fundamental in fluorescence microscopy and also quickly emerged in super-resolution applications. Nevertheless studying the axial resolution remains challenging due to the lack of robust test structures. 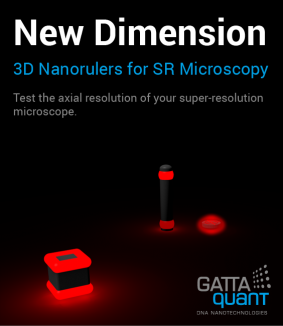 GATTAquant now offers 3D nanorulers for high-performance STED and localization-based SR systems. Data analysis is further supported by an upgrade of the GATTAnalysis software.